In 1993, Bernadette Hansen Boué and Joyce Hansen published From Sturdy Roots, a history of the Hansen family. They briefly mention an interesting incident in the life of Marie Classen Hansen. She met an American legend-and didn't much care for him. Marie Classen was born in on December 26, 1853, in Ouveiler Cantor, Echterhach, Luxembourg. 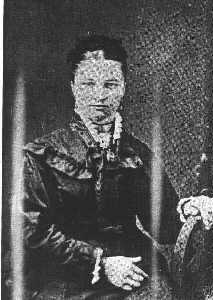 She emigrated to the United States in 1872 at the age of 18 and settled in St. Paul where she was employed as a governess for the children of General Samuel Sturgis. Marie probably had a decent education, but what may have recommended her most for the position was that she probably knew at least four languages, German, French, Luxembourg, and English. English may have been her weakest language. While living and working in St. Paul, Marie visited the Decker family which was living on a farm west of Rockville. The Deckers may have been friends from back in Luxembourg. Because the Deckers had only a team of oxen, they relied on Michael Hansen for transportation. Apparently, during those visits, Marie met Michael's son, Peter (Pierre) Hansen. Unlike Marie, Peter had virtually no schooling (7 days), so he had his father write a letter to Marie proposing marriage. Marie accepted and they were married in St. Paul on June 1, 1874. "General" Samuel Sturgis was, in fact, a Colonel and the Commanding Officer of the 7th Cavalry. General was a courtesy title because he had been breveted to that rank during the Civil War, but reverted to his Regular Army rank after the war was over. A similar situation applied to his Second-in-Command, Lt. 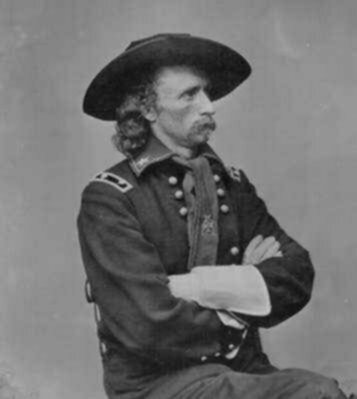 Colonel George Armstrong Custer. He was always called General in recognition of his Civil War rank, not his Regular Army Rank. Sturgis and Custer didn't like each other. To Sturgis, Custer was a flamboyant glory hound who took foolish risks and whose command abilities were questionable. To Custer, Sturgis was an overly cautious officer whose caution got him into trouble in situations where dash and courage might have won the day. Then there was the matter of "irregularities" that Sturgis had found in Custer's handling of military procurement ten years earlier. It was almost impossible for both officers to be in the field together. This would have tragic consequences in 1876. One day, Custer was a guest at the Sturgis home. Marie met him and thought him a "smart aleck." Apparently, she retold the story of meeting Custer often enough for it to enter Hansen family lore. What Custer did to receive such an unfavorable evaluation by Marie isn't recorded. Perhaps she merely picked up an opinion from her employer. Perhaps Custer was a bit overly gallant to the young governess. Marie's character, as revealed in other stories recorded in From Sturdy Roots, suggests that she would not have been amused. Or, perhaps, it was more a case of hindsight coloring a memory. A few months after Marie's wedding, the 7th Cavalry relocated its headquarters from St. Paul to Fort Abraham Lincoln on the Missouri River in Dakota Territory. In 1876, Sturgis, still the 7th's Commanding Officer, was ordered to a desk job while his Second-in-Command led most of the regiment on a punitive expedition against the Sioux. On June 25th, 1876, Custer led the 7th into the Battle of the Little Bighorn.